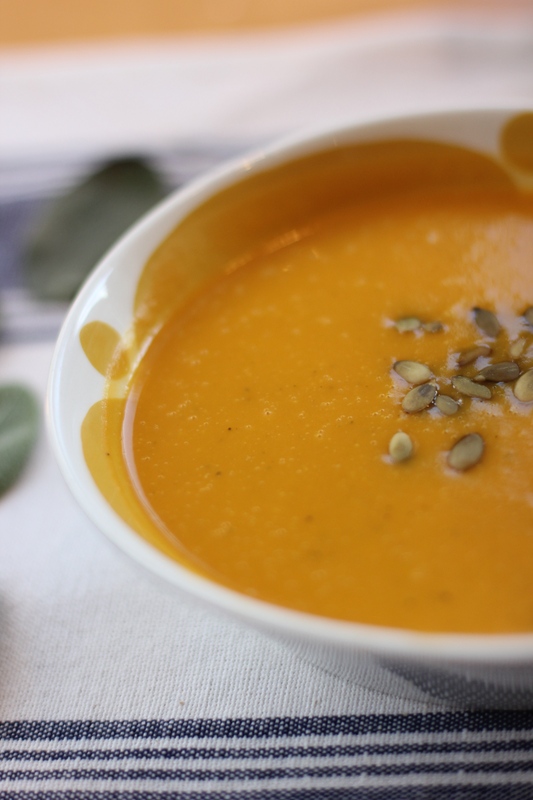 This soup is like a yummy sip of fresh Autumn air. It has a sweet buttery taste and is oh so fun to make! 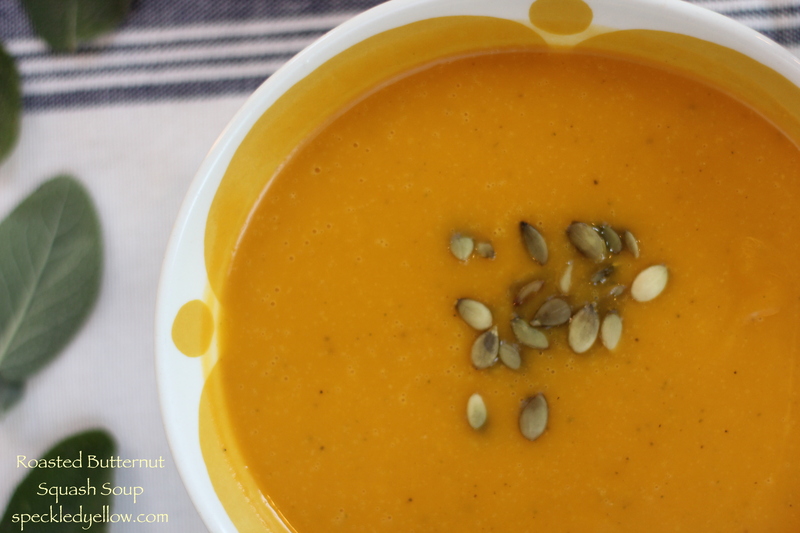 The buttery scent of the roasting butternut squash filled my kitchen with a lovely aroma. It was almost like I purchased a butternut squash Fall scented candle, but nope, just roasting one up in the oven! 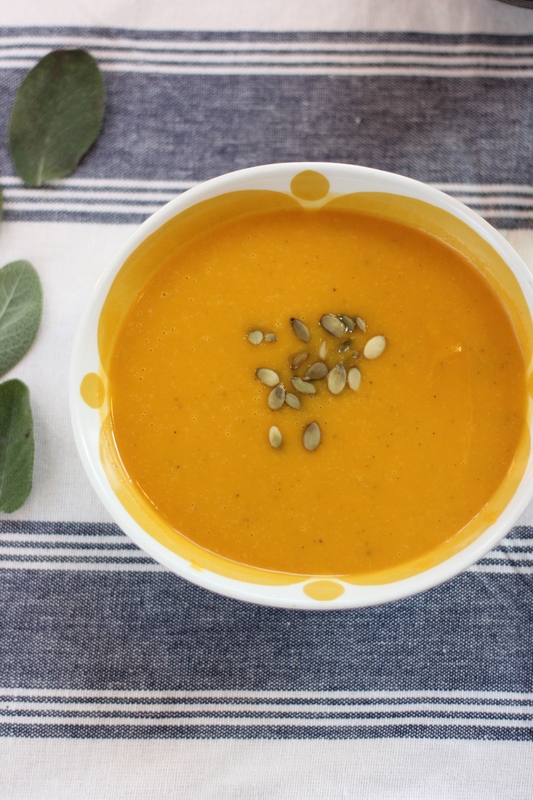 The mix of squash, green apple, and sage is just perfection, and the pumpkin seeds on top add a delectable crunch. 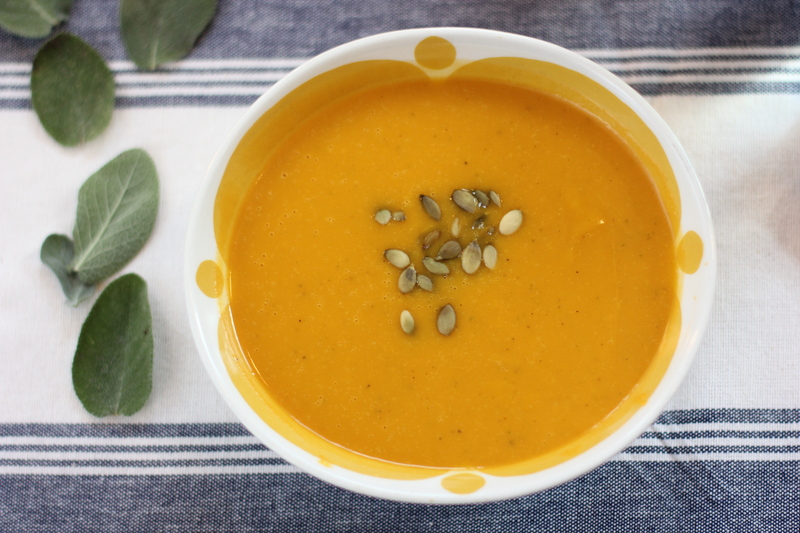 Usually, you find these soups to have heavy cream, but the almond milk definitely did the trick and no cream was harmed in the making of this soup. I have been eating this soup for practically the past two weeks. The first time I made it I wanted to drink it like a smoothie, and this week ,I have been dancing around the kitchen as I eat if for lunch everyday! It’s literally THAT GOOD! The husband seriously, seriously….seriously approves! At first he asked for just a little bit but I poured him a large bowl and he was convinced he wouldn’t finish it all. Well folks…he licked the bowl clean!!!!!!!!! 2. Grab the butternut squash. Heat it in the microwave for 2 minutes to make it soft. Chop off both ends then peel the butternut squash. Cut the squash lengthwise in half and scoop out the seeds. 3. Line a baking sheet with tin foil. Heat 1 Tablespoon of the Earth Balance butter up so it’s melted. Place the squash onto the baking sheet cut-side up and brush the butter onto the squash coating all sides and in the center. Roast until knife tender, about 50 minutes to 1 hour. 5. Meanwhile, peel, core, and cut the apple into medium diced pieces. Get the garlic ready, or if you do not have a garlic press, chop it up into fine pieces. Melt the remaining tablespoon of Earth Balance butter in a large saucepan or Dutch oven over medium heat. Add the apple, garlic (either the tiny chopped pieces, or use a garlic press), and sage, season with salt and pepper. Cook, stirring occasionally, until softened, about 7 minutes. Remove from heat and set aside. 6. When the squash is ready, take it out of the oven and let cool for a few minutes. After it has cooled, dice it into 1-2 inch pieces and place into the saucepan with the sautéed apples and garlic. Stir gently, breaking up some of the butternut squash pieces. 7. Add the broth, water, salt and pepper. Stir to combine, and bring to a boil over medium-high heat. Reduce the heat to a medium simmer, stirring occasionally about every 15 minutes, and breaking up any large pieces of the squash. Next, remove from the heat and stir in the almond milk. 8. Finally, pour the ingredients into a blender until smooth. You may have to do this in batches if it does not all fit. (quick trick just in case: Remove the small cap (the pour lid) from the blender lid and cover the space with a kitchen towel to allow steam to escape and prevent the blender lid from popping off). Taste and season with salt and pepper as needed and enjoy with some pumpkin seeds on top to add a flavorful crunch! Thanks for sharing, your recipe looks delicious!